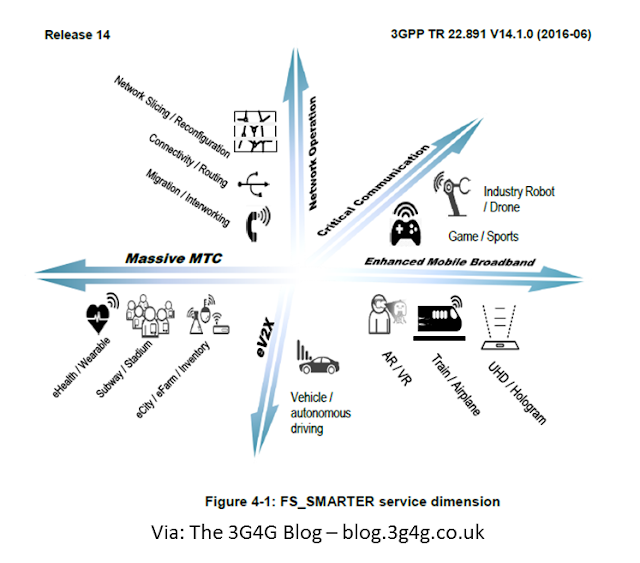 3GPP SA1 (see tutorial about 3GPP if you dont know) recently released four new Technical Reports outlining the New Services and Markets Technology Enablers (SMARTER) for next generation mobile telecommunications. 3GPP TR 22.891 has already identified over 70 different which are into different groups as can be seen in the picture above. These groups are massive Internet of Things (MTC), Critical Communications, enhanced Mobile Broadband, Network Operation and Enhancement of Vehicle-to-Everything (eV2X). TR 22.861, FS_SMARTER – massive Internet of Things (MTC): Massive Internet of Things focuses on use cases with massive number of devices (e.g., sensors and wearables). This group of use cases is particularly relevant to the new vertical services, such as smart home and city, smart utilities, e-Health, and smart wearables. TR 22.862, FS_SMARTER – Critical Communications: The main areas where improvements are needed for Critical Communications are latency, reliability, and availability to enable, for example, industrial control applications and tactile Internet. These requirements can be met with an improved radio interface, optimized architecture, and dedicated core and radio resources. TR 22.863, FS_SMARTER – enhanced Mobile Broadband: Enhanced Mobile Broadband includes a number of different use case families related to higher data rates, higher density, deployment and coverage, higher user mobility, devices with highly variable user data rates, fixed mobile convergence, and small-cell deployments. TR 22.864, FS_SMARTER – Network Operation: The use case group Network Operation addresses the functional system requirements, including aspects such as: flexible functions and capabilities, new value creation, migration and interworking, optimizations and enhancements, and security. Embedded below is 3GPP TR 22.891 which has a lot of interesting use cases and makes a useful reading.